Whoosh. Another Christmas has come and gone – it was a whirlwind (as always) and went by way to fast (as always) but was a good time & a success! This year we were low key on the side of decorations due to the Little Nutmeg being rather full of grabby hands. We had a pink plastic pre-lit Christmas tree (really) – it was a work prize for DH back in the summer when they moved locations. 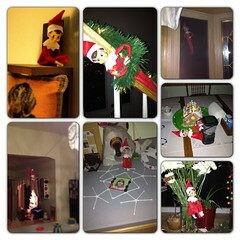 We had some garland and lights, a few printed signs, and this year we brought in an Elf on the Shelf. There are a zillion ideas on Pinterest, and I made a note of a few, but our elf was less into mischief and more into a daily game of hide-and-seek. The Lorax loved it. 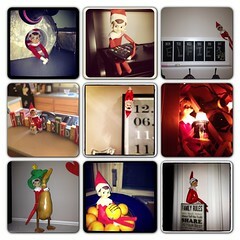 Elfie, our elf, is a bit creepy looking, but it makes for fun photos – here’s the round up of my instagram shots of where he hid. 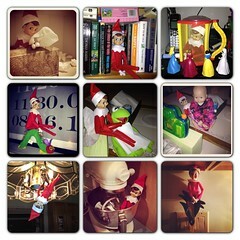 My favorite was when the Disney Princesses captured Elfie in a bug box! Though I did have a last minute flare-up of thinking that I must knit ALL.THE.THINGS. for Christmas gifts, in the end I knit 4 things. 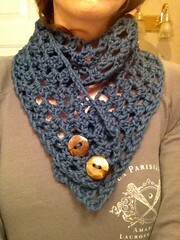 My mom had pinned several times cowls on pinterest as a not-so-subtle hint to me. I worked up a Fiona Button Scarf very quickly! I still consider myself a beginner crocheter and this was a piece-of-cake pattern. 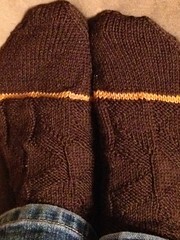 I’m calling these my DIY-gold-toe socks, even though the gold toe stripe is really not in the right spot. I started these Cauchy socks for Dan back in March. He had forgotten about them! They were very well received – he has worn them every day after work! I would indulge in the Spud & Chloe Fine yarn again and trying these on for the photo made me realize that I need to make myself some new socks!! I also made Dan a basic guy beanie with Green Mountain Spinnery Mountain Mohair that he loved – the hat is ready to go and in his car, so no photos yet. It’s snowing / raining now, so maybe tomorrow or the weekend? It seems that winter weather has truly settled in! One family Christmas party involved a Yankee Swap this year. I made Oatmeal the Snowman to go with a gift card. 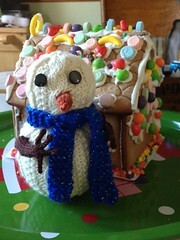 I love this little snowman and will be making myself another one! Unfortunately we had to duck out right after we picked out our gifts because it was getting late with the kids – so I have no idea who ended up with the snowman, or if he was loved. I hope! In my little nutmeg, we had a nice Christmas. There were yarnie gifts which are great & I am very excited for 2013. I am working on my “resolutions” and what I want to accomplish / try, but for today (and probably the rest of the week), we’re recovering – I think we all have a touch of Holiday Hangover and both kids are sick with sniffles / coughs / temps. How was your holiday? You know Kermit the Frog’s muppet flail? That pretty much sums up how I’m feeling this week – tempered with a great deal of numbness, because it is near impossible to avoid the news out of Newtown. Not that you should ignore the news, but it is just so emotionally loaded that it takes a lot out of you. Anyway, I’m trying to find that balance and not veer towards grinchiness. I’ve had a few projects just not work out the way I envisioned and they have been put on the back burner until my head clears. My work area is a mess of work related stuff, knitting / crochet related stuff, and I’m feeling overwhelmed by the clutter and my to-do list. I am really looking forward to December 27th or so when I can start to clear everything out and start over! 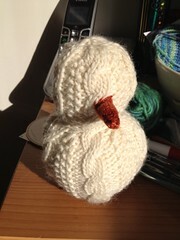 I’ve been working on an Oatmeal the Snowman that will be part of a Yankee Swap. I am going to have a rather hard time giving him away – luckily, I believe I will be able to make another one – this first one used up half a skein. I’m working on the arms now and have to do his scarf. Even partially done he makes me happy! The weather has been so grey, rainy and generally icky, I would be happy to see some snow! This little snowman will hold me over for a bit! 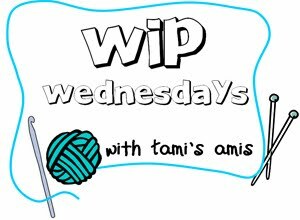 This is my first time linking up to WIP Wednsdays! I usually do Yarn Along, but I’m not reading anything and I do want to make sure I don’t let the dust bunnies into the blog! My heart hurts. I have been a classroom teacher, I have practiced lockdown drills. I am a parent to a 5 year old who attends school. I live in Connecticut, maybe an hour away from Newtown. This feels a lot like after 9/11 – a pit in your stomach and a whole lot of WTF?! This morning when I brought L to school all the parents were saying so much to each other with just eye contact. Because I don’t really know what else to do when I feel this way except to pray and to knit, I’ve joined a group on Ravelry: 600 Monsters Strong for Connecticut (and Facebook page). The goal is to knit a huggable critter for every child at the Sandy Hook Elementary School. I’m also planning to participate with Fresh Stitches – similar idea, they are looking for knit, crochet, or sewn softies within the next week or so. Stacy is not organizing, but rather she’s a great point person to get the information out there – and she has a bunch of great patterns I have had in my mental queue for a while. Thank a teacher, hug your kids, let’s all try to be patient and kind to each other this week. Thank you to the lady in front of me at the post office – she had a pile of packages to mail; I was only buying stamps and had the baby with me. She let me go before her. Pay it forward!